Homemade Christmas ornaments are some of the most popular Christmas crafts around, and the more adorable they are, the better. No matter what age you are or what background you come from, these cute crafts are sure to put a smile on your face, especially because most of these ornaments are already smiling! Make wonderful Christmas crafts with your kids in some of these great projects, or grab a couple friends to crochet some of the more advanced patterns together. These handmade ornaments are lovely little gifts, and there's no doubt that they will utterly delight everyone who receives them. The smallest things often bring about the most joy, and these insanely cute crafts are no exception. People love mini Christmas trees, and for good reason. Tabletop trees are the kind of DIY Christmas crafts every crafter loves. Since there is no set way to make a tabletop tree, the different styles are innumerable. Find the best assortment in our DIY Christmas Decorations: 12 Tabletop Christmas Trees eBook. When Santa delivers presents, he puts them under the tree. 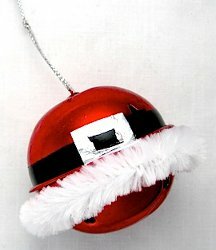 Give Santa a reason to grin when he looks up and sees cute ornaments that are dedicated to him. One of the most popular Christmas characters is the snowman, and there's no limit to the adorable possibilities associated with snowman crafts. After all, you can make a little snowman body out of almost any craft material. 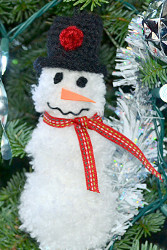 Get creative with your adorable ornaments when you make snowmen. We all know that the best Christmas tree decorations are DIY Christmas ornaments. This is why we made this collection of DIY Christmas Ornaments: The 36 Best Ball, Beaded, Crochet, Felt, Knit, and Paper Ornaments. Check it out! These Christmas treats look so delicious, but they're not for eating! From lollipops to ice cream to cookies and more, your tree will look good enough to eat by the time you're done with these food crafts. Step back and admire your handiwork when you see these scrumptious ornaments adorning your tree. Santa can't deliver presents without his reindeer, and consequently, reindeer make fabulous Christmas ornaments! 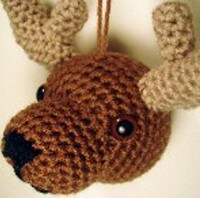 Crochet a reindeer ornament out of your favorite yarn, or upcycle wine corks for your latest Christmas craft. These adorable animals are perfectly cute decorations for your tree. 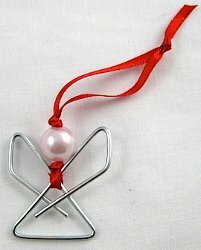 Need a totally precious angel craft for your tree this year? How about an ornament that really demonstrates the reason for the season? These holy crafts are lovely projects that are festive and cute. We handpicked the best mason jar crafts around. Check out this free eBook, 7 Mason Jar Christmas Crafts & Christmas Gifts in a Jar. Learn how to make Christmas Mason jar crafts that look great and cost next to nothing to complete! While all of the ornaments in this collection are cute crafts, there's something about these three that really screams adorable. Just look at the precious faces on all of these ornaments. You'll wonder why you haven't put smiles on all of your Christmas projects. Which of these cute ornaments is your favorite? Oh my, an entire book of great ornaments to make! I have gone to holiday heaven! I looked thru and I honestly don't know which one to pick first. I may flip a coin. I know the nutcrackers for sure and the metal angel and , and, lol. I thank you all for sharing this treasury of great projects and ideas. You have truly inspired me. The happy lights ornament is just about the cutest thing ever!